If you want to know what betaine is and how it can improve your health and performance, then you want to read this article. Betaine has been getting a lot of attention these days. Heart doctors have known about it for quite some time, but it’s a relative newcomer to the workout supplement space. You’ll find it in quite a few pre-workout and “muscle building” supplements, but what is it and how does it work? Moreover, how much can it really improve our health, exercise performance, and body composition? Well, you’re going to get simple, science-based answers to those questions and more in this article. By the end, you’re going to know what betaine is, why people supplement with it, how it can benefit you, how much you have to take, what the side effects are, and my favorite betaine supplement. Why Do People Supplement with Betaine? What Are the Benefits of Betaine? Betaine reduces the risk of heart disease. What Is the Clinically Effective Dose of Betaine? What Type of Results Should I Expect From Taking Betaine? Does Betaine Have Any Side Effects? Betaine, also known as trimethylglycine, is an amino acid found in various foods like beets (hence the name), spinach, and quinoa. Betaine performs two major functions in the body. It acts as a methyl donor. It acts as an osmolyte. “A what and what?” I can hear you thinking, so let me explain. Betaine is rich in a special type of group of carbon and hydrogen molecules called methyl groups. These groups can be passed around in the body through a process called methylation, and this is a vital part of many physiological processes ranging from genetic activity to the functions of proteins and more. Betaine is also an osmolyte, which is a substance that helps balance fluid levels inside and outside cells. This is also vitally important because fluid imbalances can cause cells to die either by shrinking too much or swelling to the point of bursting. To increase exercise performance and gain muscle and strength faster. As you’ll soon see, betaine’s cardiovascular and digestive benefits are well established and understood, but its effects on physical performance and muscle growth are less so. Unlike many of the supplements on the market, studies show that betaine can be a valuable addition to your regimen. Improve muscle performance and body composition. Let’s take a closer look at how betaine does these things. Betaine decreases levels of the amino acid homocysteine circulating in the blood. It accomplishes this by “donating” one of its methyl groups to homocysteine molecules, which converts them into the harmless substance methionine. This can reduce the risk of heart disease and stroke because too much homocysteine in the blood causes plaque to form in the arteries, making them hard and clogged. Obesity, alcohol abuse, and diabetes cause fatty acids to build up in the liver. Some fat in the liver is normal, but if there’s too much, it can harm your health in various ways. This is known as Fatty Liver Disease. Well, research shows that betaine helps the liver break down fatty acids, which means it helps prevent fatty acid deposits from accumulating in the liver. It can even help people recover from liver damage. Your stomach must be sufficiently acidic for food to digest properly. If acid levels are too low, your body won’t be able to completely break down the food you eat and absorb its nutrients. This makes it easier to develop nutritional deficiencies and increases the risk of various diseases and dysfunctions. The acid that does most of the work here is hydrochloric acid (HCl). If you don’t have enough HCl in your stomach, your digestion is going to suffer. That’s why the form of betaine that’s attached to hydrochloric acid (betaine HCl) is often used to help raise acid levels in the stomach and relieve many gastrointestinal issues. Research shows that betaine can increase muscle power and endurance and accelerate muscle growth and fat loss. That’s why it’s finding its way into more and more workout supplements. It’s worth noting, though, that the body composition benefits weren’t seen in this study. We don’t quite know why, yet (scientists are still looking for answers), so all we can really say at this point is while betaine will likely improve your workout performance, it may or may not help you build muscle and lose fat faster. For betaine, the effective dose depends on why you’re taking it. To reduce homocysteine levels and promote good liver function, the lowest effective dose is 500 mg daily. For those with liver damage or disease, 1000 to 2000mg taken three times daily is required. To improve digestion, betaine HCl can be taken in doses ranging from 650 to 2000 mg per day. To boost exercise performance and muscle gain and fast loss, 1000 to 6000 mg per day was used in the studies that reported positive results. As with all natural supplements, don’t pin unrealistically high expectations on betaine. Remember that supplements don’t build great physiques–dedication to proper training and nutrition does. Slight increase in resistance training performance. Possible slight increase in muscle gain and fat loss. That said, it doesn’t mean you shouldn’t supplement with betaine. It just means you shouldn’t supplement only with betaine if you really want to move the needle. For example, while betaine may only improve your weightlifting performance by, let’s say, 3 to 5%, if you combine it with several other ingredients with similar effects, you’re now looking at a 15 to 20% boost in your workouts. The same goes for fat loss supplements. While supplements like caffeine, synephrine, and yohimbine are all proven “fat burners,” they’re most effective when combined. In healthy people, side effects are rare with betaine supplementation. Some people can experience diarrhea or nausea, but this isn’t common. When dosing gets up into the several grams per day, the breath and sweat can take on a fishy odor. If that happens to you, supplement with about 200 mg of riboflavin (B2) per day and it should go away. I should also note that if you’re taking medications for liver or heart disease, or are at high risk of heart disease, it’s a good idea to consult a physician prior to starting betaine supplementation. Betaine is often found in pre-workout supplements, and now you know why. It helps you have better workouts…if you take enough. If a pre-workout drink contains less than 1 gram of betaine per serving, don’t buy it. It’s underdosed. You want to see at least 1 gram per serving, but if you look at the research, 2 to 3 grams is better for reliably increasing physical performance. Now, if you’ve made it this far, you’re probably not surprised to learn that my pre-workout supplement PULSE contains a clinically effective dose of 2.5 grams of betaine per serving. 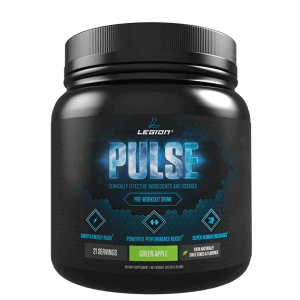 The bottom line is if you want to feel focused, tireless, and powerful in your workouts…and if you want to say goodbye to the pre-workout jitters, upset stomachs, and crashes for good…then you want to try PULSE. Betaine is one of the few supplements that are affordable and proven to boost physical performance. If your budget permits, it’s a worthwhile addition to your supplementation regimen. It can help you push a bit harder in your training, however, and may help you add muscle faster as well. And that, in time, can result in greater progress toward your goals. If you’re going to supplement with betaine, I recommend you combine it with other proven performance enhancers like creatine, citrulline, and beta-alanine. While you may not notice much of a difference in your workouts when taken individually, the cumulative effects of these supplements can be substantial. What’s your take on betaine? Have anything else to share? Let me know in the comments below!